Author Mike Chinn creator of Damian Paladin and author of WALKERS IN SHADOW, returns with a stunning character of a different sort. Pro Se Productions proudly announces the debut of Chinn’s Quarrel in REVENGE IS A COLD PISTOL, available in paperback, hardcover, and digital formats. The War Between the States is over, but the scars are still livid. The town of Endurance, Missouri is another casualty: a ghost town; deserted, forgotten. Into its hollow shell rides Quarrel, a man haunted by war, searching for something. Someone. Maybe the Comte d’Orphée, the deranged Frenchman who has fled the Juaristas to recreate a lost dynasty in the mountains. Or the easily bought ex-Confederate Guy Estafette. Or maybe Jonas Frederickson from back East, the leader of the Knights of Canaan. All have secrets; all are on the run. All want Quarrel out of their way. And pretty soon, more than one will discover that revenge is best served cold, from a pistol. Author Mike Chinn puts his own mark on REVENGE IS A COLD PISTOL, a pulpy western thriller. From Pro Se Productions. 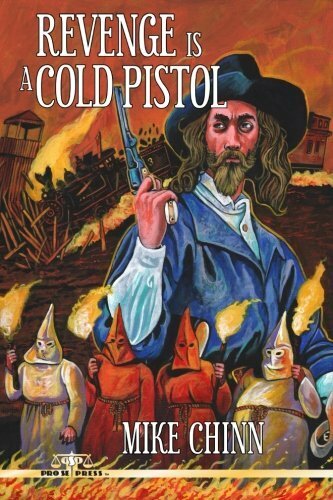 With a stirring cover by Larry Nadolsky and print formatting by Marzia Marina and Antonino Lo Iacono, REVENGE IS A COLD PISTOL is available now at Amazon at https://www.amazon.com/Revenge-Cold-Pistol-Mike-Chinn/dp/172451038X/ref=sr_1_1?ie=UTF8&qid=1533402532&sr=8-1&keywords=revenge+is+a+cold+pistol for 14.99. Chinn’s western thriller is also available for $22.99 in hardcover at http://www.lulu.com/shop/mike-chinn/revenge-is-a-cold-pistol/hardcover/product-23748004.html. Quarrel’s first appearance is also available as an Ebook, designed and formatted by Lo Iacono and Marina for only $2.99 for the Kindle at https://www.amazon.com/Revenge-Cold-Pistol-Mike-Chinn-ebook/dp/B07G2M8D1B/ref=sr_1_1_twi_kin_2?ie=UTF8&qid=1533403399&sr=8-1&keywords=revenge+is+a+cold+pistol.. This book is also available on Kindle Unlimited, which means Kindle Unlimited Members can read for free.